Hi there! Today I present you a study entitled Chlorine and hydrogen degassing in Vesta’s magma ocean, by Adam R. Sarafian, Timm John, Julia Roszjár and Martin J. Whitehouse. This study has recently been published in Earth and Planetary Science Letters. The goal here is, from the chemical analysis of meteorites which are supposed to come from Vesta, understand the evolution of its chemical evolution. In particular, how the degassing of its magma ocean impacts its chemical evolution. I have presented the small planet (4)Vesta in that post. Basically, it is one of the largest Main-Belt asteroids, with a mean radius of some 500 km. The craters at its surface and the dynamical models of the early Solar System show that Vesta has been intensively bombarded. 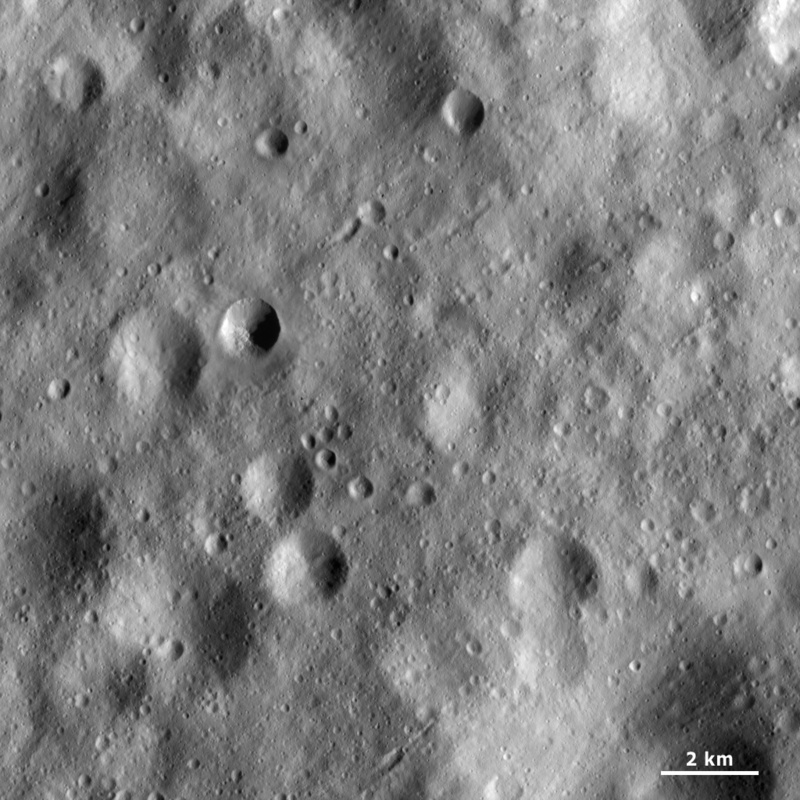 The largest of these impacts were energetic enough to melt Vesta and trigger its differentiation between a pretty dense core, a shallow magma ocean and a thin crust. Despite having been visited by the spacecraft Dawn, the magma ocean has not been detected. Its presence is actually confirmed by the analyses of meteorites which fell on Earth. Every day, about 6 tons of material hit the surface of the Earth, after having survived the atmospheric entry. Mineralogists split these meteorites into several groups. 5% of these meteorites are HEDs, for Howardite-Eucrite-Diogenites. These are achondritic basaltic meteorites, which are supposed to present similarities with Vesta. This hypothesis has been proposed in 1970 after comparison of the spectrum of Vesta and the one of these meteorites, and enforced since by the observations and theoretical works. So, it is now accepted that these meteorites come from Vesta or bodies similar to it, and studying them is a way to study the chemical composition of Vesta. In this study, only the Eucrites will be addressed. They represent most of the HEDs, and contain 2 phosphates: the merrillite and the apatite. Moreover, they are systematically depleted in volatile elements, compared to carbonaceous chondrites and the Earth. The authors have analyzed the chemical composition of 7 samples of eucrites, which were found on Earth. They present a variety of thermal alteration. Comparing them would be like watching a movie of the process of evolution of the material during the degassing in the magma ocean. The analyses were conducted on two sites: the Natural History Museum Vienna, in Austria, and the Woods Hole Oceanographic Institution (MA, USA). The involved technology is the scanning electron microscopy, which consists in obtaining images from the interaction of the sample with a focused bean of electrons, supplemented with an energy-dispersive X-ray spectrometer. This spectrometer gives the spectral signature of the interactions of the electrons with the rock sample, and so reveals the elements which constitute it. The authors were particularly interested in measuring the concentrations of halogen (fluorine, chlorine, bromine and iodine), of stable isotopes of the chlorine, isotopes of hydrogen, and water. Comparing the relative concentration of these elements in the seven samples would give information on their volatilization during the outgassing process of the magma ocean, in conditions that do not exist on Earth. The samples show different compositions in volatile elements (H2, H20, and metal chlorides), which show that there is some outgassing in Vesta’s magma ocean. The authors show in particular a large variability in the ratio [Cl]/[K], i.e. chlorite with respect to potassium. This means that not only the thermal evolution tends to reject volatile elements, but also that they are effectively ejected. This might be a concern since the ocean cannot be seen at the surface of Vesta. Anyway, this does not preclude outgassing, either through the crust, which is supposed to be thin, and/or with the assistance of giant impacts, which created craters deep enough to reach the ocean. This way, we have a signature of the history of a planetary body in material found on the Earth. These results might have implications beyond Vesta, i.e. could be extended to other dwarf planets, and so give us information on the chemical evolution of the Solar System. I hope you enjoyed this article. As usual, I am interested in your feed-back. So please, leave me some comments, share it, and happy new year! The study, which can also be found on ResearchGate, thanks to the authors for sharing! Hi! Today I will tell you about a recent study made in Serbia on the dynamical influence of the small planets Ceres and Vesta on the Asteroid Belt. This study, Secular resonances with Ceres and Vesta by G. Tsirvoulis and B. Novaković, has been accepted for publication in Icarus. There are many small bodies in the Solar System, here we just focus on the so-called Main Belt, i.e. a zone “full” of asteroids, which lies between the orbits of Mars and Jupiter. The word “full” should be taken with care, since there are many asteroids populating it, but if we cross it, we would be very unlikely to meet one. This zone is essentially void. It is estimated that the total mass of these asteroids is only 4% of the mass of the Moon. It is called “Main Belt” since the first asteroids were discovered in this zone, and it was long thought that most of them were in this Main Belt. At this time, hundreds of thousands of them have been identified, but the Kuiper Belt, which lies behind the orbit of Neptune, might be even more populated. The dynamics of these bodies is very interesting. It could contain clues on the early ages of the Solar System. Moreover, they are perturbed by the planets of the Solar System, especially the giant planets. As a consequence, they have pretty complex dynamics. Their orbits can be approximated with ellipses, but these are not constant ellipses. They are precessing, i.e. their pericentres and nodes are moving, but their semi-major axes, eccentricities and inclinations are time-dependent as well. To represent their dynamics, so-called proper elements are used, which are kind of mean values of these orbital elements, and which are properties of these bodies. Ceres and Vesta, or more precisely 1 Ceres and 4 Vesta, are the two largest objects of the Main Belt, with mean radii of 476 and 263 km, respectively. So large objects could present complex interior structures, this is one motivation for the US space mission Dawn, which has orbited Vesta between July 2011 and September 2012, and is currently in orbit around Ceres, since March 2015. This space mission has given, and is still giving, us invaluable data on these two bodies, like a cartography of the craters of Vesta, and the recent proof that Ceres is differentiated, from the analysis of its gravity field. The asteroids are so small bodies than they are subjected to the gravitational influence of the planets, in particular Jupiter. The most interesting dynamical effect is the orbital resonances, which occur when a proper frequency of the orbit of the asteroid (for instance its orbital frequency, or the frequency of precession of its orbital plane, known as nodal precession) is commensurate with a proper frequency of a planet. In such a case, orbital parameters are excited. In particular, an excitation of the eccentricity results in a destabilization of the orbit, since the asteroid is more likely to collide with another body, and/or to be finally ejected from the Main Belt. This results in gaps in the Main Belt. The most famous of them are the Kirkwood Gaps, which correspond to mean-motion resonances between the asteroids and Jupiter. When the orbital frequency of the asteroid is exactly three times the one of Jupiter, i.e. when its orbital period is exactly one third of the one of Jupiter, then the asteroid is at the 3:1 resonance, its eccentricity is excited, and its orbit is less stable. We thus observe depletions of asteroids at the resonances 3:1, 5:2, 7:3, and 2:1. Another type of resonance are the secular resonances, which involve the precession of the pericentres and / or of the node (precession of the orbital plane) of the asteroid. In such a case, this is a much slower phenomenon, since the periods involved are of the order of millions of years, while the orbital period of Jupiter is 11.86 years. An analysis of the dynamics (proper elements) and the physical properties of the asteroids shows that it is possible to classify them into families. The asteroids of these families are thought to originate from the same body, which has been destroyed by a collision. They are usually named among the largest of these bodies, for instance Vesta is also the name of a family. In this study, the authors investigate the dynamical influence of Vesta and Ceres on the Main Belt. They particularly focus on the secular resonances, in identifying four of them, i.e. resonances with the precessions of the pericentres and nodes of these two bodies. For that, they perform numerical integrations of the motion of 20 test particles over 50 Myr, perturbed by the 4 giant planets, with and without Ceres and Vesta, and show significant influence of these bodies for some of the particles. Finally, they show that some asteroid families do cross these resonances, like the Hoffmeister family.